We offer infant to preschool programs for children ages 6 months to 6 years old in a learning environment that offers cognitive, physical and social development. 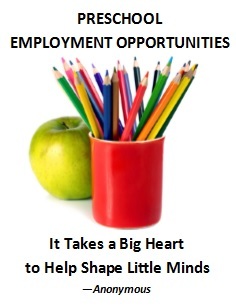 We are a year round school and currently have openings for two teachers. The first position is primarily for a teacher in the 2's program also working as a teacher throughout the preschool. The second position is for a teacher in our infant program who will be working the infant room (must have or be willing to get infant units). These are two full time positions 35 to 40 hours per week. The position includes medical and dental benefits. Resurrection is a Christian school and applicant must be comfortable with and supportive of the school’s mission. Please call (925) 828-2122 x3 or send resume to rlc-sharon@pacbell.net.